Diatonic scale on C, equal tempered Play (help·info) and just Play (help·info). Pythagorean diatonic scale on C Play (help·info). A plus sign (+) indicates the syntonic comma. 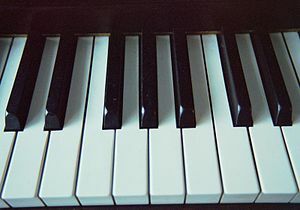 The diatonic scale is one of the scales used in music. It is also called heptatonic scale, because it uses seven distinct pitch classes or tones. For each octave there are five whole steps and two half steps. The two half steps are separated by two or three whole steps. The word "diatonic" comes from the Greek διατονικός, meaning progressing through tones. This page was last changed on 3 January 2018, at 12:06.